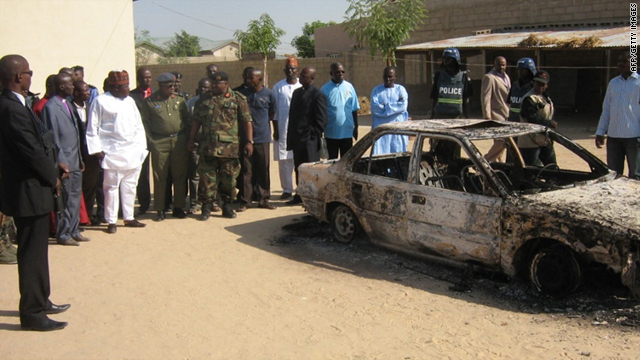 Borno state governor Ali Modu Sherif (in white kaftan) inspect the charred remains of a car outside a Victory Baptist church in Alamderi neighbourhood of the northern Nigerian city of Maiduguri on Saturday. One eyewitness says, "I counted eight corpses"
(CNN) -- Five blasts went off in the Nigerian city of Jos Friday night as residents were celebrating Christmas Eve, leaving 31 dead, a regional government official said. Choji Gyang, a special adviser to the governor of Nigeria's Plateau state, said two bombs went off in the Angwa Rukuba area of Jos. Within five to 20 minutes, three more blasts happened in the area of Kabong, he said. "We have a lot of casualties and are struggling to cope," Gyang said. Hassan John, a Jos resident and journalist with the media department of the Anglican Diocese of Jos, had just come out of church about 7 p.m. (1 p.m. ET) when he heard the sound of the first explosion. He rushed to the site, which he described as a beer parlor frequented by locals. "By the time I got there, there were women crying, people screaming. It was all chaos, people were screaming, blood everywhere." "I counted eight corpses all over, seven in the building," John said. He added that a second blast went off within a couple of minutes after the first one. "We cannot say if there are more bodies under the rubble because it was dark," John said. Gyang, who is special adviser on religious affairs to the governor, said it was unclear who set off the blasts or whether they were related. "It was Christmas Eve, lots of activities was going on. People were still preparing for Christmas, lots of people were coming into town. A blast went off, those around the area -- some were killed, some injured and the houses and cars caught fire," Gyang said. He said he received reports of "a lot of dead bodies." "The way they went off was in the same manner. They all went to where people were concentrated,"Gyang said. Several injured people were taken to a local hospital while some who were not severely injured left the scene on their own. John said the beer-parlor scene was chaotic as residents, especially young men, became agitated over the lack of security in what has been a volatile area. Hundreds of people from both faiths have died in violence between Christians and Muslims in Nigeria in the past decade. "Soldiers fired a couple of rounds into the air because a riot was developing," John said. The first blasts occurred just a few buildings away from a police station and a military checkpoint, according to both Gyang and John. "Five different bombs blasts in the heart of Jos. This is the height of insecurity in this city," Gyang said. "There is a lapse in security, specifically by the special task force," he said. "They have not been doing what they were expected to and as a result we had these attacks." In recent weeks, the governor's office had received letters purported to be from some Muslim organizations threatening attacks against Christians, Gyang said. "The security officials didn't take the threat letters seriously. They were thought of as gimmicks, and at the end of the day, they became reality."